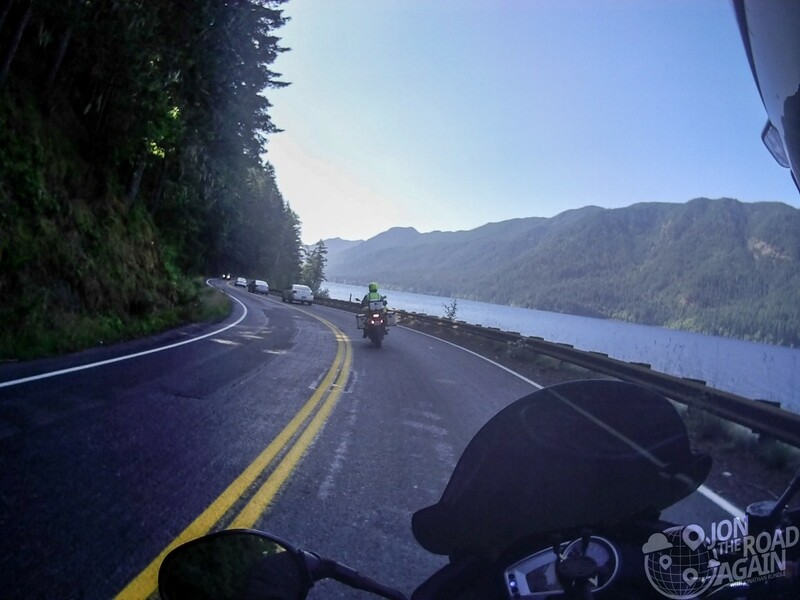 Two great days in my favorite Washington destination – motorcycling the Olympic Peninsula. 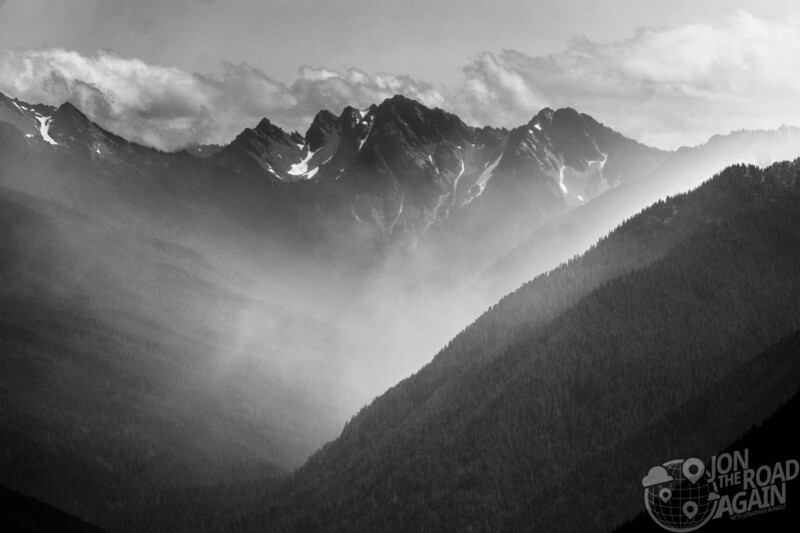 The rugged beauty of the peninsula is without compare. This post serves as a starting point for a few more destinations on the trip. 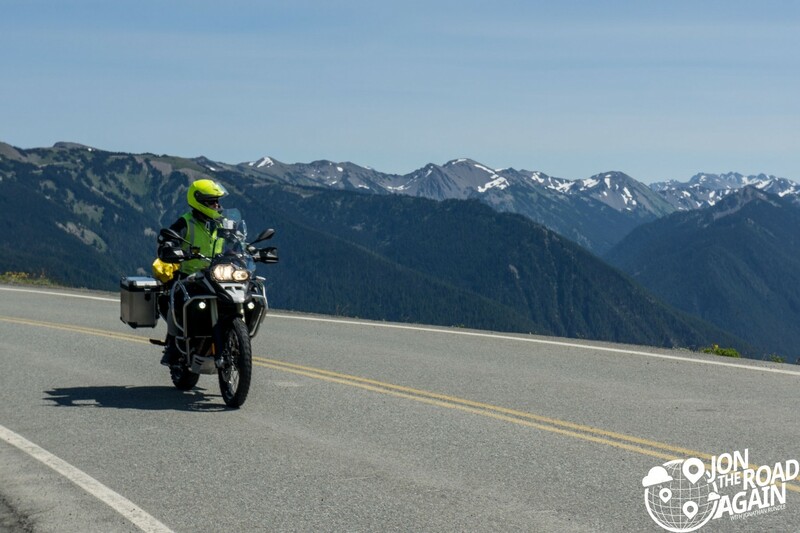 In this 650 mile loop+more of the peninsula, in this post, we’ll visit Hurricane Ridge, Lake Crescent, and the Hoh Rainforest. Visit these other posts to read about Neah Bay, Cape Flattery, Hobuck Beach, and Lake Quinault and the surrounding wilderness. Starting at Hood Canal, I pick up a new friend for this journey, Matthew. He very capably rides a BMW GS, while I’ll be putting on my adventure boy pants in the Tiger 1050. 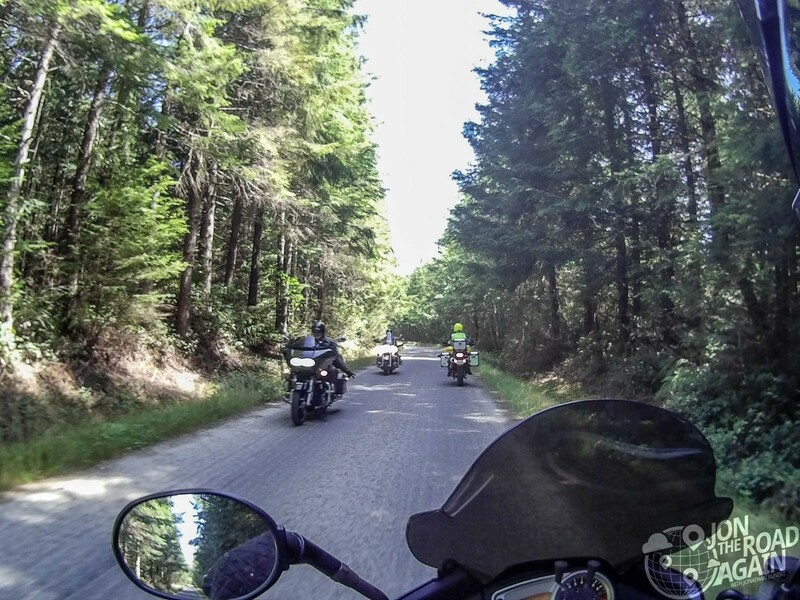 Exploring the roads around Port Townsend, I can tell Matthew knows the area well. 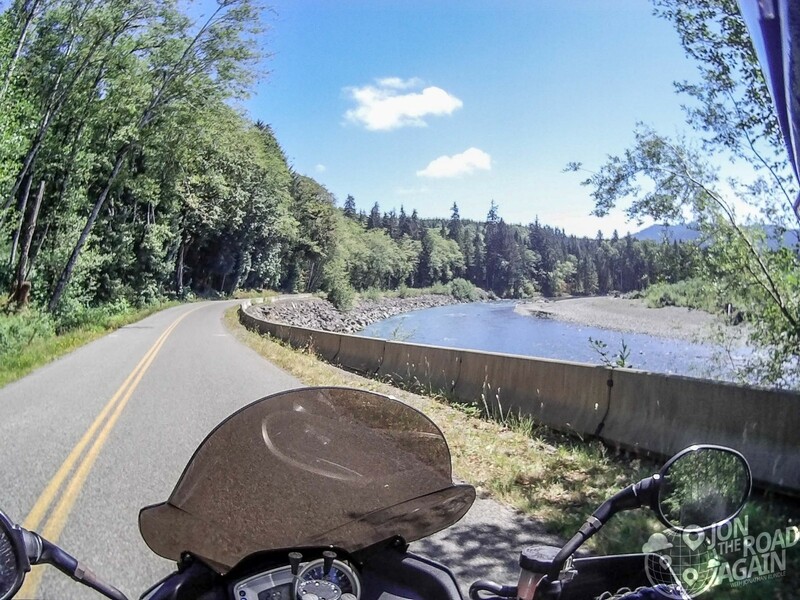 This is great since I’ve always stuck to the main roads (which are still plenty of fun) but have wanted to venture onto Hwy 101’s many tributaries. After a lunch stop in sunny Sequim, we’re onward to Hurricane Ridge. A place I’ve blogged about many times before. 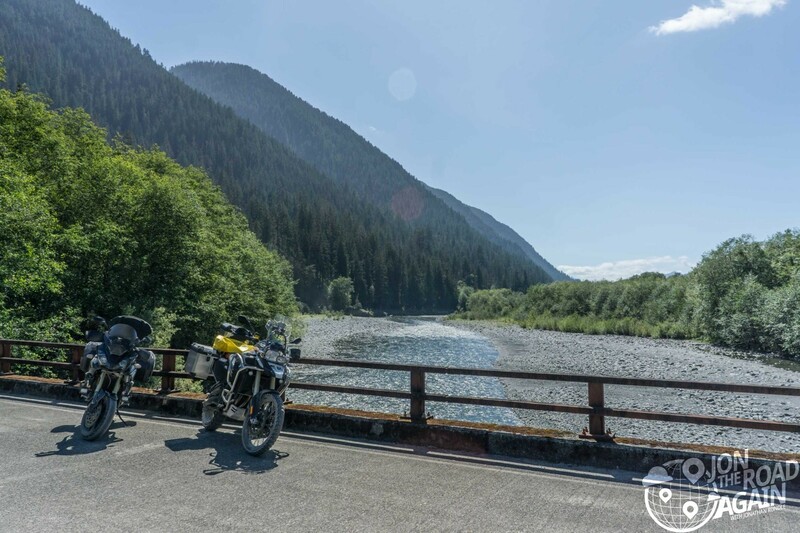 This time, the plan is to explore Obstruction Point Road, which dips down from the overlook and into the wilderness via a one-lane gravel road. Unfortunately, there are wildfires in the park which forced the park service to close the road. Darn. We’d spend the rest of the trip making up for our lost off-road time. 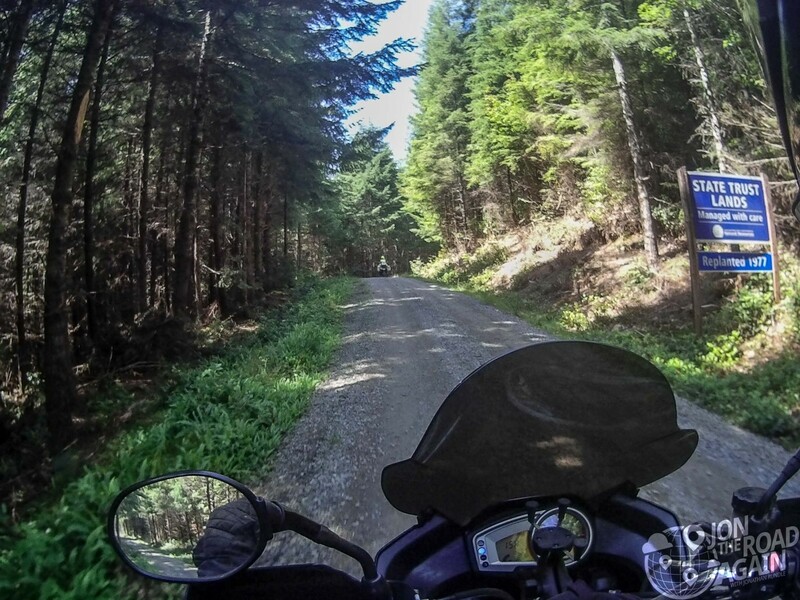 We left Hurricane Ridge via Little River Road, which has very little traffic, nice twisties and a gravel section that goes up into state trust lands. Popping back onto Hwy 101 until we split to Neah Bay. Click to read more on that part of the journey in another post. Between here and there, you are treated to edge-of-the-lake views of stunning Lake Crescent. 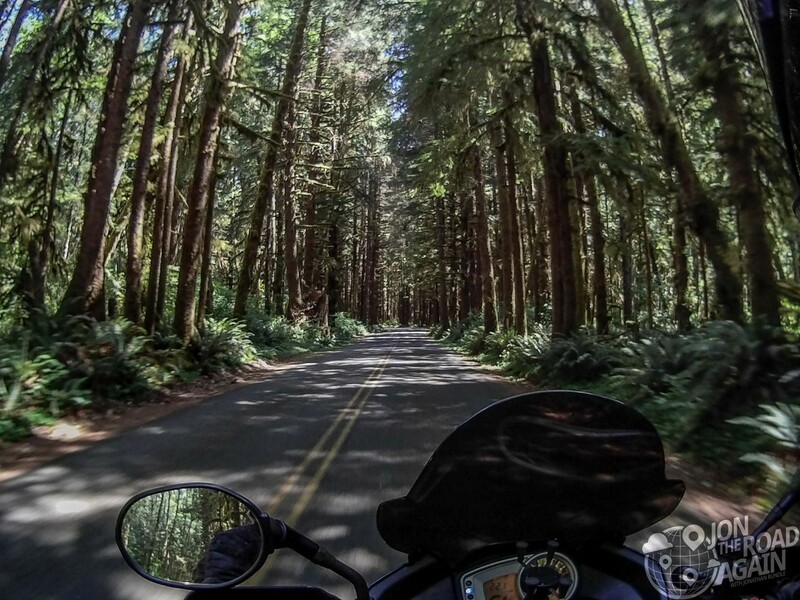 Around the horn, is the Hoh Rainforest. The Hoh can get up to 170 inches of rainfall per year. For comparison, “rainy” Seattle receives only 34 inches per year. No such rain today, we’ve got perfectly clear skies and the sunlight is tickling the moss as it filters through the trees. Too graphic? The road through here is twisty and paved nicely—but on a busy day like today beware the park rangers. Matthew has been keen on seeing this huge tree he has visited before. Since I’ve never been to the Hoh, I think I need to see this tree. Uh oh. The signs pointing to “Big Spruce Tree” seem to be pointing to this massive stump. 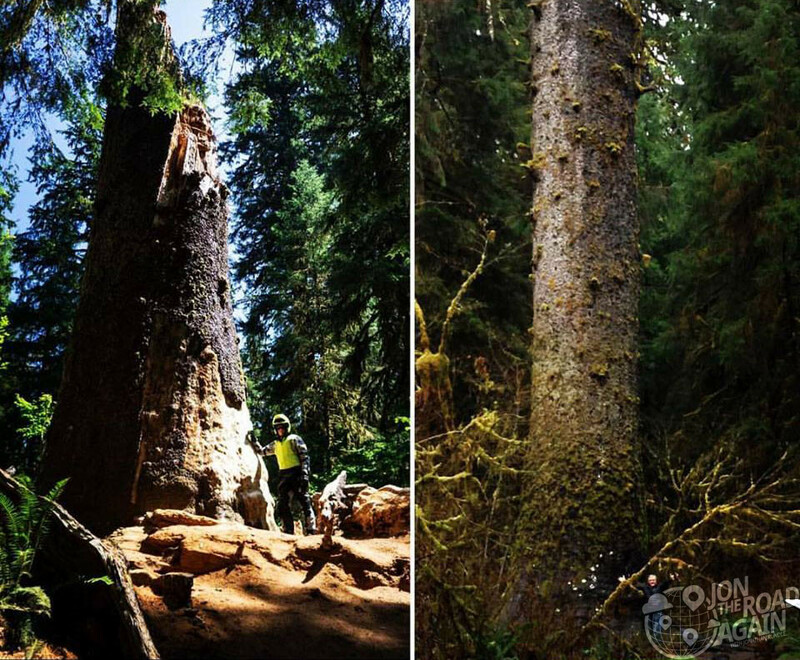 On December 9, 2014, the tree, one of the world’s largest Sitka spruce trees, couldn’t take the wind and rain from a strong storm and snapped. It left behind this stump, called a snag, where birds are likely to nest. 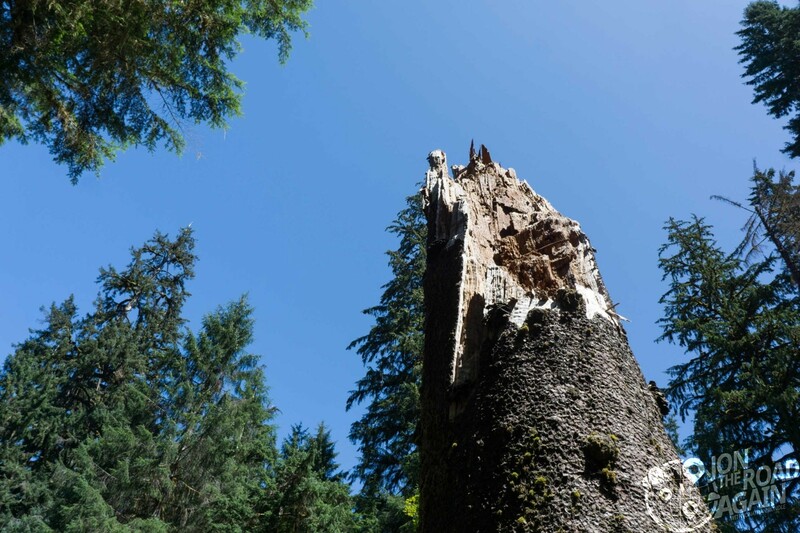 The other part of the tree remains on the forest floor and will become a nurse log, providing nutrients for seedlings. Matthew posted a photo of his dad with the tree on Facebook, which I have added here for comparison. Onward, we take another side trip from 101 to see another big tree, this time the “Duncan Cedar” the world’s largest Western Red Cedars. Hey, cruisers aren’t supposed to be out here! Props to these guys for not only finding a little gravel but also for waving! After this road, things got a little more choppy, but nothing to chatter your teeth too badly. 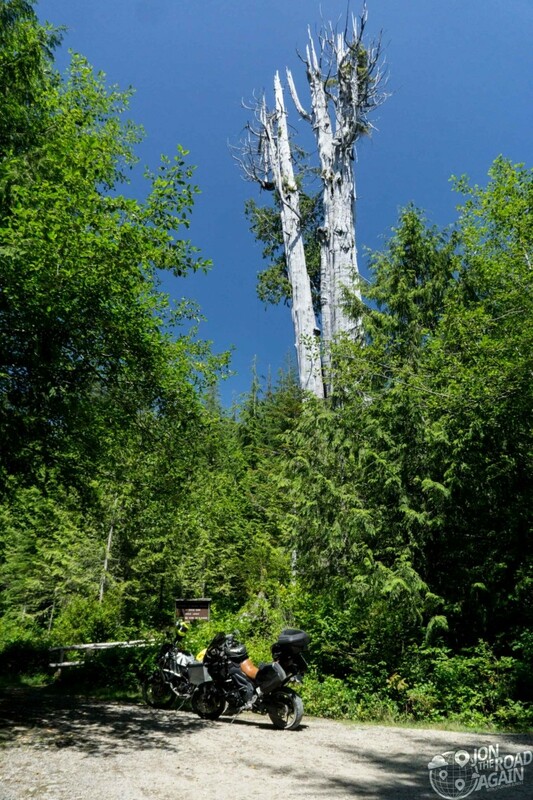 Standing tall at a height of 178 feet and with a diameter of 19.4 feet, the Duncan cedar is mostly a bleached skeleton with some living branches near the top. 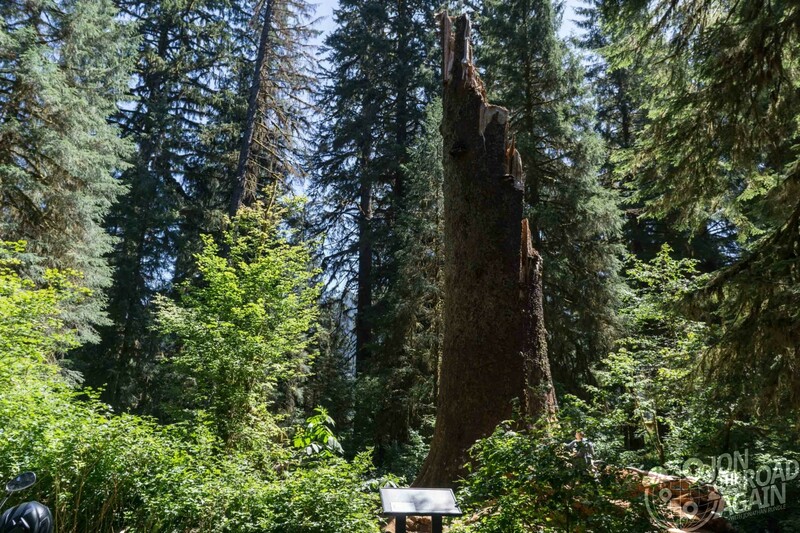 While this tree was saved from logging many years ago, the surrounding trees were not so lucky. Of course, the giant could not survive the fierce winds of the clear-cut that surrounded it. First, the mosses and then the tree itself began to die. So, it is an impressive sight, but it’s too bad it isn’t a healthier tree. 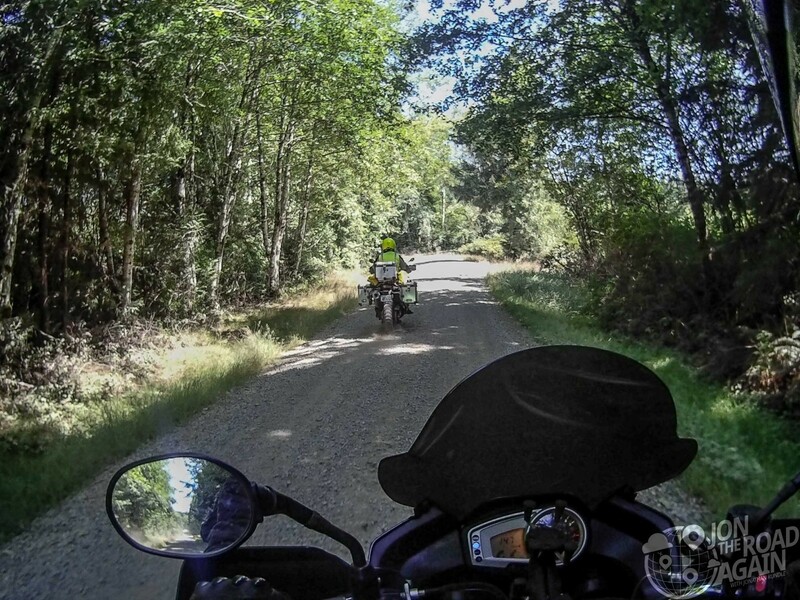 Next, we’re going to ride the incredibly fun roads surrounding Lake Quinault! Thanks for the beautiful ride. 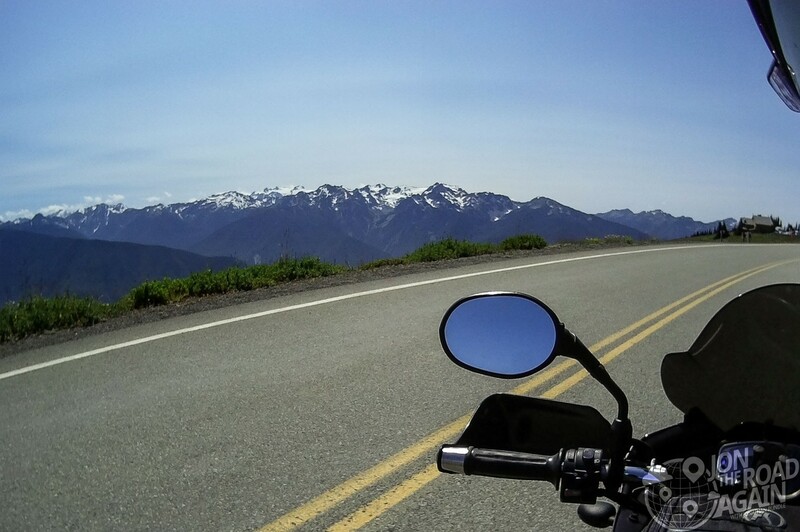 I really liked the ride by the lake and Hurricane Ridge .